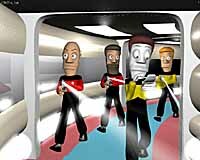 A Sev Trek movie is due to be released on video in April 2002. A truly international collaboration, it features the voices of USA comedian Wally Fields, 3d animation by Australian Andrew Simpson, music by Brazilian Marcos Kleine and the writing/direction of Australian cartoonist John Cook. Marcos Kleine launched the Sev Trek: Pus in Boots Soundtrack at a Brazilian convention on March 7. Here his exciting report of the positive feedback to the movie and his music! To clear up any confusion, the video is not yet available for sale and won't be for about 4 weeks while we wait for a rating from the OFLC. Meanwhile, I've added a list of the "Movie Merchandise" to Sev Shop. We have finished the movie and sent copies to various magazine, fan club and website reviewers (stay tuned for more on this). We have also sent a copy to the Office of Film & Literature Classification to get a rating. It takes around 4 weeks to get the rating so we hope to have the movie available for sale in late March/early April. At that point, we will begin a Pre-Order Period of 4 weeks where you will be able to buy the video and other merchandise heavily discounted (20% off everything) as well as all pre-ordered videos autographed by writer/director John Cook and animator Andrew Simpson. Then all videos will be posted out at the end of the Pre-Order Period.